This post is sponsored by Jonthings. Check out the Phone Claw, a smartphone holder crafted to look like a monster’s claw. Securely place your phone within the grips of three talon glory. It comes in a variety of colors and options. It’s not just your standard one dimensional phone holder either, the claw uses a ball joint system to detach to and from a variety of attachments. 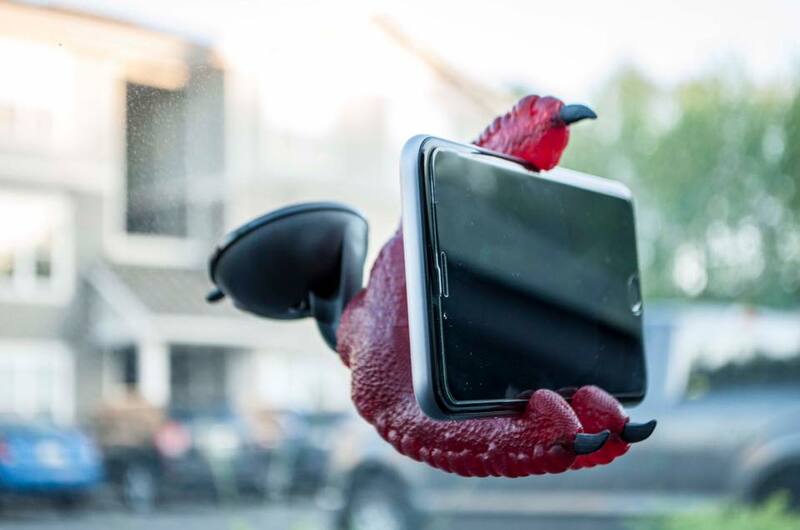 You can stick it to your windshield with the suction cup attachment or display it like a prehistoric beast trophy on your desk with the wire mount. The Phone Claw doesn’t just hold smartphones! Oh no. No no no no no. It can hold almost anything: remotes, video game controllers, headphones… The possibilities are endless! Head over to Jonthings to snag one of your own. Hell, head over to Jonthings to snag two of your own. As the saying goes, “You can never have too many monster claw smartphone holders.” People say that, right? Enter below for your chance to win a FREE Phone Claw by Jonthings! Wow, prize claw is fab. & splendid. 2 fingers snap. It is tight, fly & off the chain. Thank you for the awesomeness, the contest, and generosity. 🙂 Pick me.